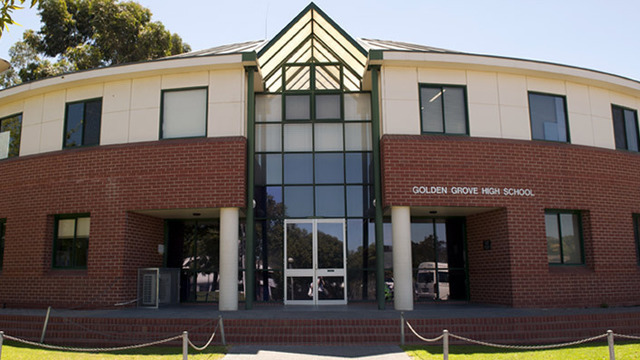 Golden Grove High School provides a caring and engaging learning environment and delivers outstanding educational services to students and the Golden Grove community. Golden Grove High was established in 1989, with exceptional facilities and curriculum opportunities for students from Years 8 to 12. At Golden Grove High School, we are committed to providing challenging, dynamic, relevant and coherent curriculum, which promotes life long learning and produces responsible, resilient, independent critical thinkers and learners who act ethically and confidently in their personal, career and community life. Our success is enhanced by sustaining positive partnerships between school, staff, students, parents and our community. Golden Grove High is a member of the Golden Grove Secondary School Campus – a consortium of three schools, public and private. Our partners are Gleeson College and Pedare Christian College. Whilst each school is independent of the others, we all access the Campus “Shared Facilities” and collaborate to offer students in Year 11 and Year 12 access to an extensive menu of SACE courses. Our school is a “Centre of Excellence” in the Arts. We are a special interest Dance School. We provide our students with high quality programs and learning pathways. High tertiary entrance scores leading to University and TAFE offers combined with high levels of SACE completion are the accepted standard for students attending Golden Grove High School.